Sometime in my early childhood I discovered that my brother was a criminal. I remember the pungent smell of pot on his clothes and the way he would stumble about in the house after a night out thieving with friends. Vincent Cooper's Zarzamora transported me back to those days. This apologize-for-nothing collection reminded me not only of my brother’s decline but of the good times, too—the car cruising and listening to loud KISS music and downtown tagging. In this bold, unadorned, and restless book, Cooper takes us to a world of family connections both good and sour, bright and dark. He introduces us to the joy of his neighborhood with their “streets of manteca” using a poetic voice that is honest and free of pretension. It is also a commanding voice and one that holds our interest from the very first page to the last. It’s in our DNA to suffer as it is to fight. The barrio is not only a setting for action but a player in the activity of the world. As the book’s extended speaker cruises his childhood home he often points out how the old elements of the neighborhood have survived and how the new have replaced them. The streets are indelibly marked by the march of people through them (“All these streets have felt the presence of my familia” (“Zarzamora”)) and “the new Aztlan” (“Zarzamora”) points to what is precious and what could have been. Family is its own character in the book, an outsized presence that ties numerous locations together, from Los Angeles to Las Vegas to San Antonio. Letters between family members relay suffering and painful moments, some of them difficult to read without thinking about the damaged lives described in them and the heavy toll the act of recapitulation must have taken on their writers’ bodies. 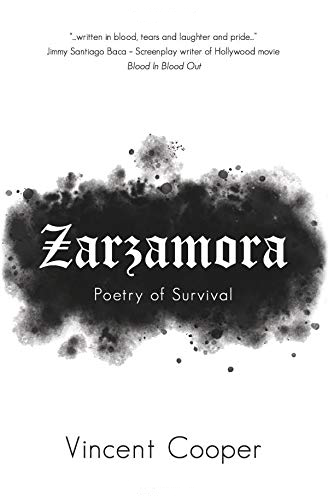 Those readers who’ve lived much rosier childhoods can still relate to Zarzamora because this is a book about growing up, about navigating through the numerous obstacles life throws at the less fortunate, and about trying to survive and thrive. The obstacles the characters in the book overcome (or are defeated by) are persistent ones caused by various traumas such as drugs and disease that connect history to the present day like an umbilical cord. “We find love in the cemeteries of our bellies and hearts. Ultimately, Zarzamora is about finding the sweet spaces in bleakness. And it is about connecting to the history that is often inescapable but does not necessarily drown. It is a thrilling debut collection. Vincent Cooper is a Xicano poet from Los Angeles, CA. Cooper’s poetry can be found in Latino Book Review (2019 magazine), Huizache - The Magazine of Latino Literature, Riversedge Journal, The Acentos Review, and AMP - The Online Digital Journal at Hofstra University. He is a member of the Macondo Writer’s Workshop selected in 2015. Zarzamora is a publication by Jade Publishing. Click here to purchase. Rodney Gomez is the author of Citizens of the Mausoleum (2018), Ceremony of Sand (2019), and the chapbooks Mouth Filled with Night, Spine, and A Short Tablature of Loss. His work has appeared in Poetry, The Gettysburg Review, Poetry Northwest, Blackbird, Denver Quarterly, Verse Daily, and other journals. He works at the University of Texas Rio Grande Valley.